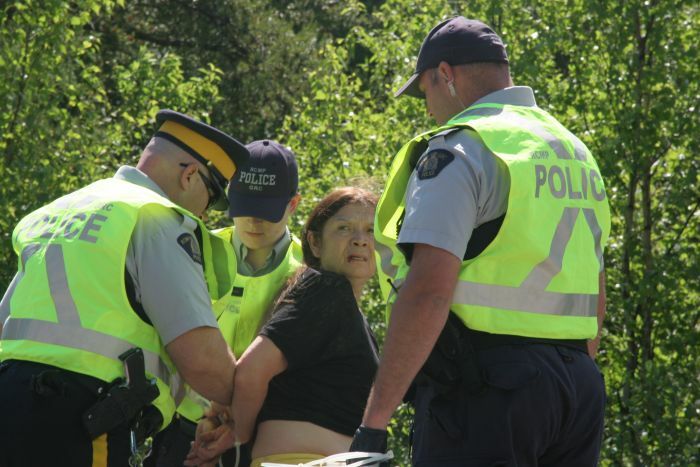 A photo taken by Miles Howe on June 21st, when 12 arrests were made near the sacred fire encampment in Elsipogtog. ELSIPOGTOG, NB - Media Co-op reporter Miles Howe has been released from police custody after being detained near Elsipogtog, New Brunswick yesterday afternoon – but Howe says he thinks police are trying to prevent him from reporting news from a controversial shale gas exploration site. Howe has been in New Brunswick since early June reporting on protests against shale gas exploration near the Mi’kmaq community. He faces charges of uttering threats to a police officer and obstruction of justice. “I think they’re trying to restrict my access to seismic testing sites,” said Howe. According to Howe, RCMP chief Rick Bernard approached him this afternoon as he stood next to Aboriginal Peoples Television Network (APTN) news reporter Jorge Barrera. The two were waiting for press access to a site where seismic testing, a precursor to hydraulic fracturing or fracking, was said to be taking place. Bernard then informed Howe that he was under arrest for allegedly uttering threats against a police officer on June 21st. The Media Co-op’s Howe “has been doing the bulk of reporting in #Elsipogtog on anti-shale gas protests and has been taken in by the Mi'kmaq community,” Barrera also tweeted. RCMP Cpl. Chantal Farrah confirmed to CBC that Howe’s arrest was indeed related to an incident on June 21st. The RCMP has not responded to the Media Co-op’s request for comment as to why his arrest was not made for 13 days. According to Howe, the timing of the arrest is odd, since he has been in contact with police in New Brunswick twice since the alleged June 21st incident without being notified that police wanted to arrest him. In particular, Howe says he gave a statement to police regarding a fire he witnessed on June 25th, involving equipment owned by SWN, the Texas-based company currently exploring for shale gas in New Brunswick. “Police went to my house in Halifax seeking a statement about the fire I had seen, since I was the first respondent [at the scene],” Howe said. “When I heard that I went to the police here and they took a statement from me about what I had seen. They knew exactly who I was, yet there was no indication that I was wanted by them for any incident on June 21st. "After they took my statement, they also mentioned that they'd be able to offer me financial compensation for information [related to the ongoing protests],” Howe added. Howe also notes that his charges changed over the several hours he was in custody, from resisting arrest to evading arrest to obstruction of justice. He had no comment on the charges themselves. Howe expressed concern for Mi’kmaq war chief John Levi, who was also charged today with obstruction in relation to Howe’s own arrest. “He’s basically been charged with abetting me [over the past several days]," Howe said, despite Levi not knowing until yesterday that Howe was accused of a crime. There is an open invitation to a “Celebration of Unity with Elsipogtog” gathering this Saturday at 10 a.m. by a Facebook group called Walk for a Ban on Fracking. “In the end [my arrest today] is just one small incident,” Howe said. “People here continue to show amazing strength. “I’m not the story here,” Howe said. Submitted by Ken Summers on ven, 07/05/2013 - 12:50.